Tell me a little about yourself and Enfield Wine Company. Where are your vineyards located? How long have you been growing wine in California? I have been in the California wine industry and involved in farming since 2004. I have worked for several well-known California Wineries including Littorai & Failla where I was the vineyard manager. Enfield Wine Co. began as a side project in 2010 making small production, fresh, natural, elegant wines that were in contrast to the high alcohol “fruit bomb” style that was popular in California at the time. In 2014, after receiving great press and seeing great response in the market I decided to grow Enfield into a full-time business. I currently farm a vineyard in Napa and purchase grapes from vineyards in Sonoma, the Sierra Foothills, and Chalone in Monterrey County. As a winemaker, how obvious is climate change’s impact on your operations? What kind of changes have you noticed in weather/soil stability over your time in California? Extremely obvious – I check the weather every day in multiple places and my entire year is driven by the climate. Certainly, last summer was the hottest I have experienced since living in CA and we had 2 of the hottest days ever on record in Napa and the hottest day in the history of San Francisco. Since 2011, which was quite cool, every summer has been on the scale from “above average temperature” to “extremely warm”. What, if anything, have you had to do to counter-act those changes? The most obvious effect is on the timing of the growing season and harvest. 2013, 2014, and 2015 were each, in succession, the earliest harvest picking dates in my career and for most everyone else I know as well. Grapes were picked anywhere from 2 – 4 weeks earlier on the calendar than in an average year. Another impact, that we are just beginning to see, is which grape variety is planted where. I make a Cabernet Sauvignon from a vineyard on the Sonoma Coast – an area more known for Pinot Noir because of its cooler climate. I joke that this is my hedge against Global Warming, but the truth is that at this point I believe this site produces better wine as Cabernet then Pinot. Have you been impacted financially by California’s changing weather? The drought certainly had an effect lowering grape yields, which raised the price of grapes and hence wines produced. Modern farming techniques have allowed a fair amount of flexibility and kept quality generally high, but if the warming trend continues we will see many people having to replant their vineyards to different grapes – and eventually we will see a decrease in quality in wines such as Pinot Noir that cannot handle heat. Pinot Noir is probably the grape most potentially harmed by this warming trend, and it is a major economic driver in the CA wine industry. This past year, we experienced record-high temperatures and an excess of rain. How do these extreme weather patterns disrupt wine production? It definitely made for extremely difficult and expensive farming. Extra manual labor was required as grape vine canopies were extremely vigorous, while at the same time disease pressure was very high from the heat and humidity. Either additional sprays were necessary or loss of crop to mildew and rot. Due to warming temperatures in California, it stands to reason that certain wine varieties will no longer be the same. How does this affect your marketing of certain wine varieties? As I mentioned above, modern farming techniques such as irrigation and canopy management do allow a certain amount of flexibility, however they all add cost and there is a limit to their effect. Cooler climate varieties will get pushed out of warmer growing areas – Pinot Noir most prominently, but also Chardonnay and to a lesser extent Sauvignon Blanc and Cabernet Sauvignon. I won’t say it has directed my marketing as of yet – other than focusing on cooler climate areas for sourcing wine grapes, but I do expect we will see a dramatic change in what is planted where over the next 20 years. We are seeing this on a small scale now, with grapes like Tempranillo, Mourvèdre, Carignan and others starting to become more fashionable. But I expect this to accelerate. Grape vines can physically grow in warmer conditions, but it becomes increasingly difficult to produce high quality wine. 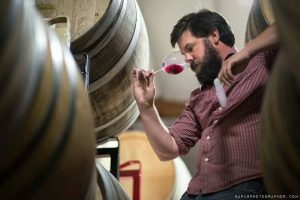 If the warming trend continues, regions in CA that are already warmer may become only suitable for bulk wine production, and cooler climate areas may begin to function more like warm climate areas and we will see a steep decline in either the planting of cooler climate varietals, or the quality. 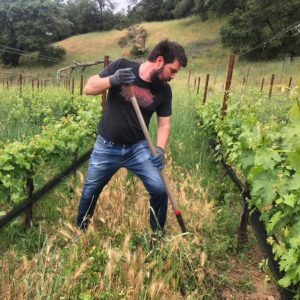 Is there anything else you’ve noticed on your vineyards that might be relevant/useful for those that want to get an idea of how great an impact climate change has on California wineries? It’s a big issue that the industry has been able to mostly handle up to this point, with surprising finesse. The quality of wine made over the past 5 years including 2017 has been very high. There is a breaking point however. It is the new normal for me to begin picking grapes in August instead of September. That can’t get bumped up much earlier without having real quality effects. I do think among the younger folks in the industry we are starting to see the change more dramatically. No one I know under 40 is banking on the future of Pinot in California. It will hopefully remain viable in small pockets, but as mass production wine it seems unlikely. I think we will continue to see more focus on Southern European Varietals – and we will see more grapes planted in areas that were once considered too cool for them – such as Cabernet on the Sonoma Coast. ← Administrative Law Acts as a Wall to Trump Administration’s Rollback of Obama-Era Environmental Regulations.